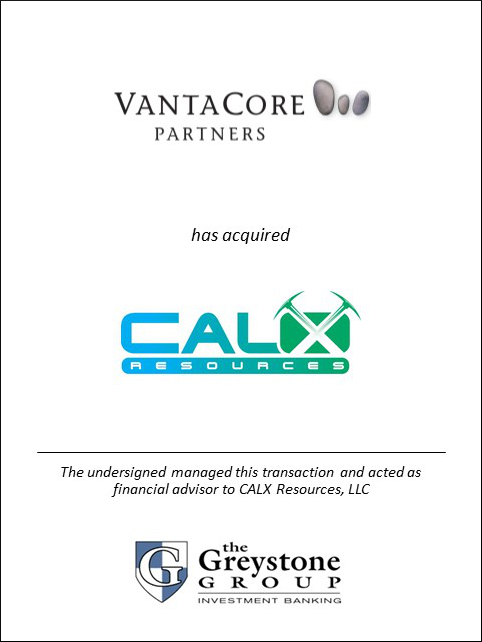 SAN DIEGO (June 16, 2015) – The Greystone Group announced today that it advised CALX Resources, LLC (“CALX”) in its sale to Winn Materials of Kentucky LLC, a subsidiary of VantaCore Partners LP (“VantaCore”). Located on the banks of the Tennessee River, CALX can supply aggregate to the local market of Greater Paducah and the waterborne markets along the Lower Mississippi River via its barge load-out facility. The acquisition integrates with Winn Materials’ Clarksville, Tennessee quarry and further expands VantaCore’s aggregate footprint along the river. CALX Resources, LLC was formed in 2008 and developed the Chaudet Creek Quarry in western Kentucky. The hard rock quarry is estimated to have in excess of 92 million tons of proven construction-grade and chemical-grade limestone. VantaCore was formed in 2006 to acquire profitable, well-managed and competitively advantaged mid-sized aggregate companies. Headquartered in Philadelphia, Pennsylvania, VantaCore operates three hard rock quarries, six sand and gravel plants, two asphalt plants and a marine terminal. Prior to the acquisition of CALX, VantaCore successfully integrated seven companies and has an experienced management team in place that will facilitate future growth both organically and through additional acquisitions.